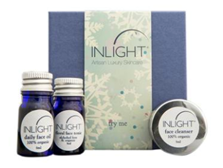 Hug Your Skin has a 100% Organic Skincare line called Inlight which takes only the finest, ethically-sourced, natural, and organic ingredients and harness them at their most potent to create a gourmet, artisan, sublimely luxurious diet for your skin. Inlight organic skincare contains the finest and most effective organic food-grade and cold-pressed oils, herbs, the purest essential oils and beeswax. That’s it. Thankfully InLight has bestowed on me the power to host a giveaway for one of my readers. 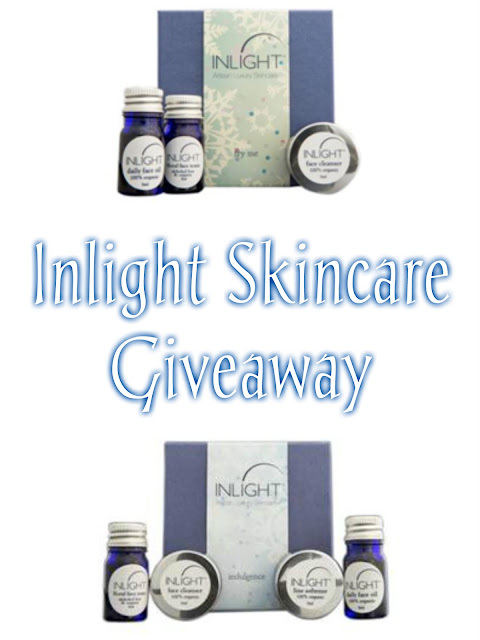 One winner will receive one of the following Inlight trial kits valued which are valued at either $29.99, $32.00 and $39.00. Selected by the sponsor of the giveaway. 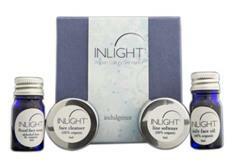 Our essential trio of products in miniature to cleanse, tone and moisturize for beautiful, radiant skin. o Face Cleanser 0.17 fl. oz. o Floral Face Tonic 0.17 fl. oz. o Daily Face Oil 0.17 fl. oz. o Line Softener 0.17 fl. oz. o Body Oil with Arnica 0.17 fl. oz. o Body Butter 0.17 fl. oz. o Foot & Leg Balm 0.17 fl. oz. o Firm & Tone Oil 0.17 fl. oz.